There's been an important breakthrough in the field of ugly Star Wars shirts today, as scientist have announced that the worst, ugliest, most awful Star Wars shirt that could possibly exist in this universe or any other universe has been created — and there's no doubt it will never, ever be topped. 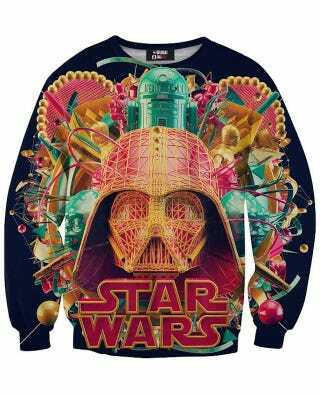 This nightmarish sweatshirt comes to us from Rage On, which is charging $60 for the privilege of wearing a shirt which looks like George Lucas ate five bags of Skittles and then vomited on it. But do you want to know the best part? At the time this article was published, the shirt is on back-order. Yes, they didn't make enough of this apparel atrocity to meet fan demand. Suddenly, Pimp2-D2 seems clever and restrained, doesn't it?